Happy Wednesday, everybody! The it's all downhill from here... which, of course, is a good thing, because that means it's an easy coast into the weekend, where you can do weekend-like things! But to get you to that glorious promised land of extra sleep and pajama daywear, let's ease the way with a few escape games. This week! Vitamin Hana wants you spinning in circles, but at least you've got a hula hoop. 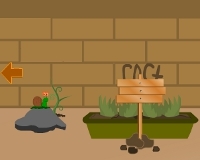 MayMay has some garden pests that need to be taken care of, plus a few puzzles. And no1game takes an unorthodox approach to gameplay that's going to involve some clever computer tricks. Find the Escape-Men 169: Desktop - There are two entries to this clever little computer-based escape from no1game, where your beloved desktop starts acting strangely after installing a new game. As usual, there are ten little green men for you to find, but you'll need to think out... um... inside the box to get them all by fiddling with your computer's settings and rooting through its files. Find 5 Snails - Who doesn't love snails?... well, gardeners, I suppose. And MayMay apparently, since you have to track down a palm's worth before you'll be allowed to leave. Unlike most gardens, however, this one involves less backbreaking, sweaty work and fire ant bites than it does puzzle solving. Which begs the question... did the snails set all this up? That seems... troublingly smart for something so small and slimy. Beware the snails. Twist and Turns - Vitamin Hana turns you right 'round baby, right 'round with an escape that will have you going in circles. Sure, it seems innocuous... who among us, after all, does not have a room dedicated to hula hoops and cryptic artwork? But these puzzles might take a bit of elbow grease to solve, while others might just need a fresh perspective. Weekday Escape N°103 Walkthrough now available! The forecast calls for green men. Check the weather app that's running on the desktop. One of the pictures has a green guy. Click on "Recover the File". Wonder who he's in love with. No, really, check the pictures folder. Though you may need to turn up the lights. Use the brightness button on the bottom of the screen to set the brightness to 100%, then click the escape man in the bottom picture. And then check your to-do list. Count the card suits in the pictures (1 heart, 2 spades, 3 diamonds, 4 clubs). Look in the Documents folder for a subfolder called ToDo. Open all the folders until you find the zip file. Put in the code from the pictures to unzip the file. When in doubt, run a virus check. Open the Anti-Virus and click the "scan computer" button. Give it time to run (you can close the window), then check back to see what it found. With the desktop showing, turn down the brightness of the display to 10% and look at the screen. Click the start button and put in the code. 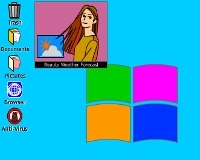 Turn on the screensaver using the button on the taskbar, then wait. The green man will pause occasionally in the bottom right corner. Well, I sure don't know the password. Do you know the password? No? Well, perhaps you could ask for help? Click the "Forgot your password" link, then check the icon in the top left corner of the messagebox. The combined green guy tells you what the password is. Input the password, then click through the messages until you see the "NO.1 SEARCHER" page. Click in the search box, then click the SEARCH button. Click the first search result. Click the Images link on the top left. Select the combined green guy and click the big image search box. Click the SEARCH button, then click the first search result. Took a while to get both endings for escape men! the paper in your inventory with x's and o's and the marker-ed up paper on the desk with numbers? I've tried flipping the paper to get different number results. Solved the Escape Men, but only by searching for clues on another site. It was really tricky! And I must be tired or something ... can barely get started on the other two and I'm stuck! Sorry, still playing Hoverboard. I'll try to get to playing these tonight after the pies are in the oven. read the circles by columns, left to right. Not rows, top to bottom. the password is still the same. The split happens after that. I think I was stuck in the same place as you, Coffeeteamix, and had to go looking for a nudge. Have you solved the clock and cabinet puzzle yet? thinking in minutes rather than hours! Make sure you are looking at the monitor directly, not at even the slightest angle. Open the images folder, look at the black picture and turn the brightness on the game's monitor to 100%. If you can't see anything, try tilting your monitor slightly, it's incredibly washed out when viewing at even a slight angle. LGM- Looking for the last guy. I know that color puzzle must be something incredibly simple but I cant figure it out. I was thinking waaaaaaaay too much. move the hands of the clock, I gave up completely, thinking I had to solve the clock puzzle first to stabilize the clock. I'm crazy. LGM - Last man, finally figured it out and yes it was simple. Open the windows of the house, then untie the curtains. Close the windows and look at the numbers. Use the code from the curtains to open the door. It's in plain sight on a rock. a) Clock, part one: think seconds, not minutes. Note that the buttons on the top door cycle through the numbers 0 through 55 in increments of 5. 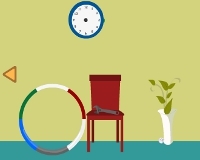 Look at the wall clock to see where each color is pointing, but pretend each one is a second hand. i. Steal the battery from the clock and put it into the remote control you got from the top door. Look at the snail shells behind the remote-control car. round/big mouth, round/no mouth, pointy/medium mouth; all mouths are at bottom right. Use the code to open the bottom right cabinet inside the house; get a device with a screen and a button. Take the battery out of the remote control and put it into the new device, then press the button on the front. Get the snail and the key. Use the key to open the drawer inside the house. Get the spade. Use the spade to dig around the sign next to the planter (outside), then flip the sign around. Note the letters on the sign (including whether they're uppercase or lowercase). Use the code to open the right-hand box under the windows. Get the garden shears. Use the shears to cut some grass. Put the grass you cut in front of the little doorway on that box/planter next to the house. You know that saying, "at a snail's pace"? Yeah, wait some more. You can try going in the house and coming out again; I don't know if it actually helps, but it makes you feel like you're doing something. Eventually, a snail will appear at the little doorway. Put your five snails into the glass box in the house. Note the pattern they leave behind them. Use the code to open the remaining box, on the left under the window. Get the oil. Use the oil on the gate latch.